This weekend (14th June) Bike Catcher will be axhibiting at this year's BHP Fuel Fest. Come say hello if you are in attendance at the show and grab yourself a free limited edition Bike Catcher cap. Only 200 of the current design will ever be manufactured. We will have 40 of these caps at the show so will be on a first come first served basis. BHP Events are proud to bring you 'BHP FUEL FEST'. 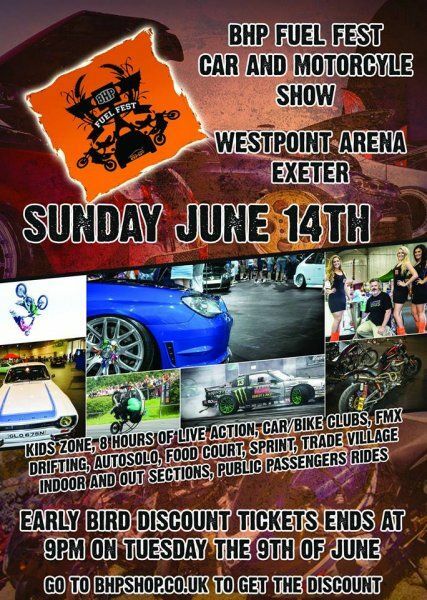 This one day event is set to take place at Westpoint Arena, Exeter, Devon on June 14th 2015. Now in it’s 2nd year, the show features performance cars and motocycles, live demonstrations, Indoor and outdoor vehicle displays, childrens entertainment, food village, and trade stands. Static displays will vary from Supercars to Superbikes, Modified Cars to Motocross, with displays indoors and outdoors. Without doubt the highlights of the event are the hours of live action. A variety of motorsport and performance demonstrations are featured, including Drifting, Autosolo, BMX Flatland, Motorcycle Stunts and FMX making it a fun day for all the family. With an all day Live Action Arena and family entertainment area, this event has something for every member of the family. We will also have a 'chill zone' for those who wish to bring the smaller members of the family and take a break from all the action and entertainment, this zone will feature a food village, Entertainment for the children, and a nice quiet area to sit back and relax. BHP Fuel fest is the biggest Car and Bike Show in the South West and with full intentions of becoming one of the TOP static performance shows in the country! Gates open to visitors at 10:00am, Last admission 4pm with event concluding at 6pm. Tickets are available on the day of the event for £15 per person and under 12’s go free!